Wash and soak the basmathi rice for about 20 min. Mean while grind the ingredients mentioned for grinding in to a fine paste and keep it aside. Do not wash the mushroom, use a clean damp cloth to wipe it. Mushrooms have the tendency of drinking up all the water and become very soggy. In a pressure cooker heat oil+ghee, add cinnamon sticks, cloves, bay leaves, fennel seeds and sauté until nice aroma comes out. Now add the onions and sauté until golden brown. Add the ground paste and sauté well until all the water in it evaporates and you will get a wonderful aroma. 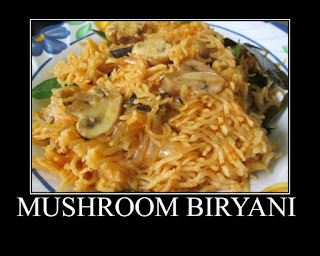 Add the sliced mushrooms and give a good stir, add the red chilli powder, coriander powder, turmeric powder, garam masala, salt and stir well until the masala is well blended. Add the yogurt mix it well and sauté for about 2 -3 min for the mushroom to cook. 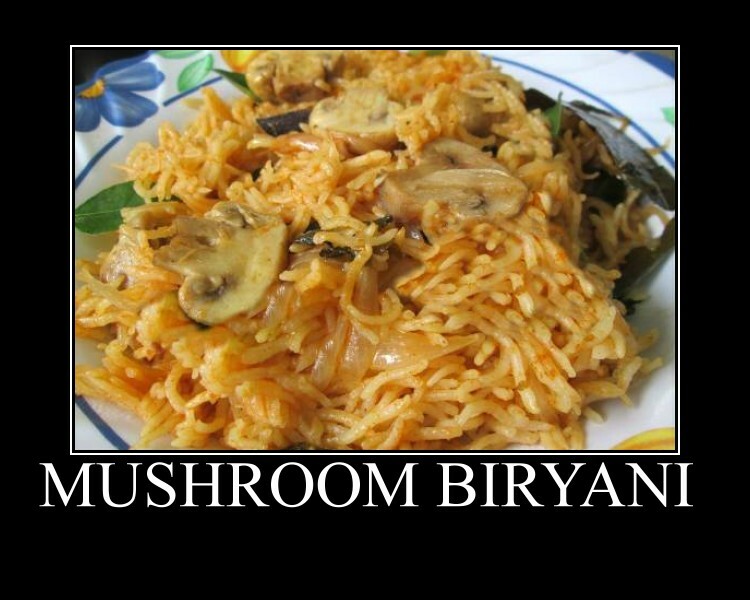 Once the mushroom is soft and masala is really blended well, add the required amount of water and let it come to boil. Now add the basmathi rice and cook for two whistles or without the whistle for about 12 -14 min. Switch off the stove after the steam releases garnish with coriander leaves and serve it hot with raita.